Share the post "The Golden Rule"
It’s always a delight finding kernels of joy early in the morning to where you feel as though the day’s going to be better than just OK. As I rounded the corner of 2nd St. NE, I happened to notice two ducks waddling about in front of my building. They appeared to be looking at something inside. After a moment’s thought, I considered the hen must’ve been looking at the blooming flowers and thinking that big pot to be a great place to build her nest. As chance would have it, I had my camera with me so I pulled farther ahead and quietly got out of my car and went around to get a photo. Unfortunately I must’ve spooked them and started wandering down the sidewalk. I got a good photo of their stroll, but I’d rather of had one of them looking in my office windows. It’s interesting to consider what must be happening Downtown when nearly all humans are asleep. There could be herds of deer dancing in the streets, raccoons swinging from street lanterns, and all other nocturnal creatures in the sewers crawling up for a night’s outing. Sometimes when driving home late in the evening, I get a glimpse of something dark with two luminous eyes shining in my headlights scurrying back down a storm sewer. I know this may sound funny now, but several years ago a landlord called and told me about an incident that happened in one of his rental properties. From what I understood, there was a not so often used toilet located in a second floor half bath. The frantic tenant called him and said, “I heard a strange sound upstairs, so I went up and found the noise coming from the half bath. When I walked in, the noise stopped. I thought I’d use the toilet while up there and when I lifted the lid, there was a giant rat in the bowl! I slammed the lid back down and went and found something heavy to hold the lid and kept flushing the toilet until it went back down.” Keep in mind I’m paraphrasing what was likely said. The tenant was adamant the house was infested with rats and wanted the landlord to do something about it. His guess was that the toilet bowl was dry from dis-use which created a free pass to the upper world. Well, the landlord in looking at the big picture, found there were city workers in the area doing sewer line work and probably caused the sewer rats to go a running. In the past I’ve had plumbers say how it’s not good to allow toilet bowls to go dry for just that reason. That rat story crosses my mind every time I encounter a dry toilet bowl. I’m sure that tenant has a vivid long-term memory regarding that incident burned into her subconscious. One of my little jobs today was to deliver some articles to an executor of an estate home I have listed. Since I’ve always been a bit of a pick about making sure items belonging to beneficiaries are delivered, I was determined to get them placed in appropriate hands. 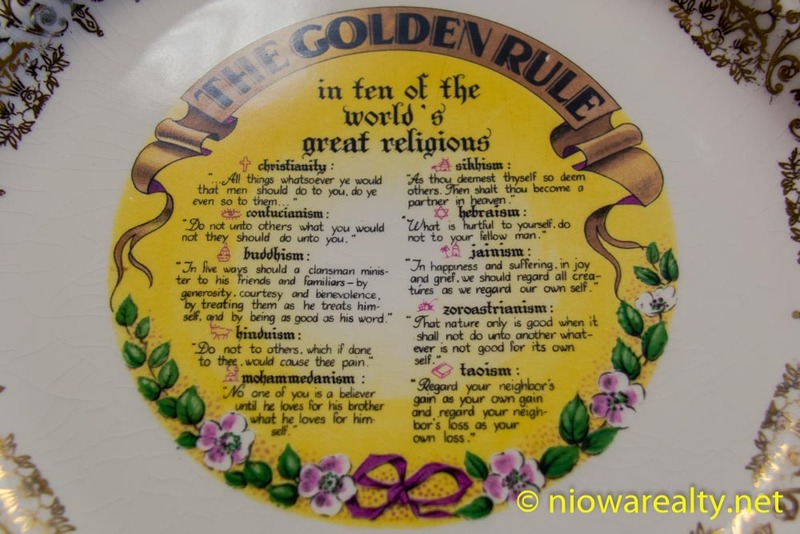 One of the items was a plate which I’ve never before seen in all my years, and when taking a closer look, I marveled at the message. If everyone in the world would read these lines and take them to heart, and actually live them, there’d certainly be few if any more religious wars on our planet. The decedent who had this hanging on a wall must have been quite the spiritualist and able to understand the real core of faith. Before I delivered it to the executor, I took it to the office and snapped the above photo. I’ll likely never again read a more moving description of the Golden Rule.